Wick away sweat and stress in this breathable, 100% polyester WICKING T-SHIRT. The wicking knit technology pulls moisture away from the body, so it's perfect as a lacrosse shirt or soccer shirt. You'll stay dry and comfortable as you're running the field in this essential top. The heat sealed label means no scratchy tags to distract you, and the double-needle hemmed sleeves and bottom make this rugged sports top built-to-last as long as you. 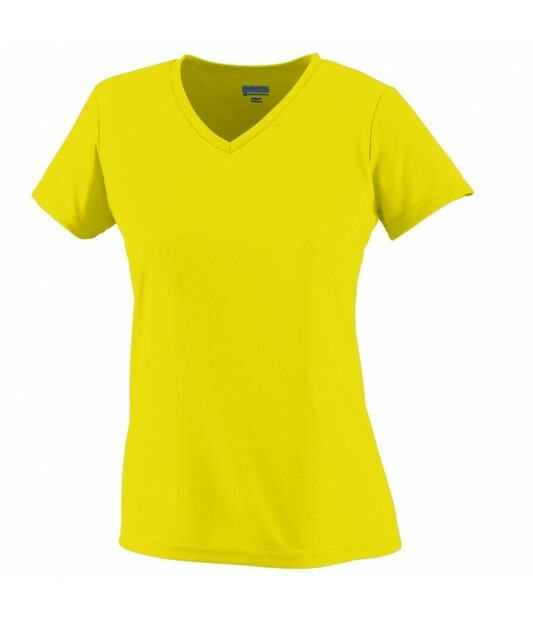 Girls' WICKING T-SHIRT is rated 5.0 out of 5 by 3. Rated 5 out of 5 by family shirt order from Good product other than running slightly tight in mid-section...really liked fabric, vibrant red color and style. Also bought matching in men and boys. Those also were tight in mid-section and neck. Rated 5 out of 5 by Irishliz from Worked perfect We had sparkly purple vinyl to adhere to the shirt. It worked perfect. My girls love the shirts.